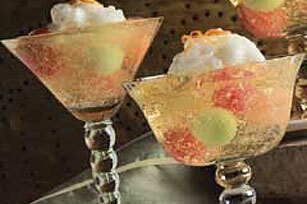 Melon balls suspended in orange gelatin are topped with whipped topping. Served in stemmed glasses, this elegant dessert resembles champagne. Stir boiling water into dry gelatin mix in large bowl at least 2 min. until completely dissolved. Stir in club soda. Refrigerate 1-1/2 hours or until thickened (spoon drawn through leaves definite impression). Add melon balls to gelatin; stir. Spoon into eight champagne glasses or dessert dishes. Refrigerate 3 hours or until firm. Top with dollops of the whipped topping just before serving. Store any leftover desserts in refrigerator. Prepare as directed, using 1 pkg. (8-serving size) or 2 pkg. (4-serving size each) JELL-O Lemon Flavor Sugar Free Gelatin. Top each serving with a sprinkle of orange zest.